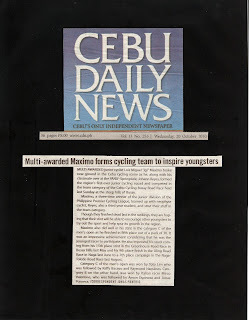 MULTI-AWARDED junior cyclist Luis Miguel "Igi" Maximo broke new ground in the Cebu cycling scene as he along with his classmate over at the PAREF-Springdale, Johann Reyes, formed the region's first-ever junior cycling squad and competed in the team category of the Cebu Cycling Busay Road Race held last Sunday at the steep hills of Busay. 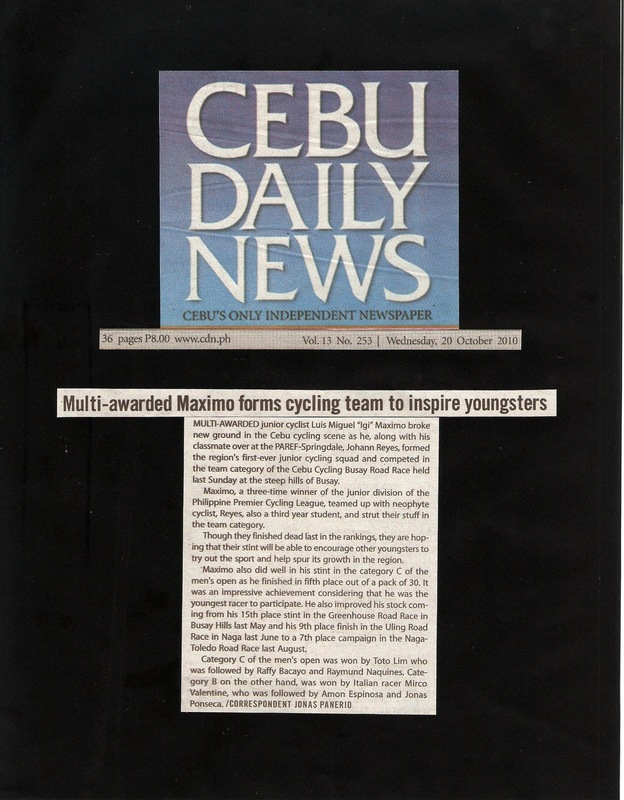 Maximo, a three-time winner of the junior division of the Philippine Premiere Cycling League, teamed up with neophyte cyclist, Reyes, also a third year student, and strut their stuff in the team category. Though they finished dead last in the rankings, they are hoping that their stint will be able to encourage other youngsters to try out the sport and help spur its growth in the region. Maximo also did well in his stint in the category C of the men's open as he finished in fifth place out of a pack of 30. It was an impressive achievement considering that he was the youngest racer to participate. He also improved his stock coming from his 15th place finish in the Greenhouse Road Race in Busay Hills last May and his 9th place finish in the Uling Road Race in Naga last June to a 7th place campaign in the Naga Toledo Road Race last August.